In my opinion, you can never have too many shrugs. That's my "knitting philosophy" and I'm sticking to it. There were a couple of interesting features that caught my eye when I first came across this shrug design. Easy front and side ribs bring the garment in slightly allowing the garment to have some shape but the look still remained comfy and casual. Sewing the front ribs together was another idea that appealed to me. Overtops or vests work well in all seasons and in all types of yarns. 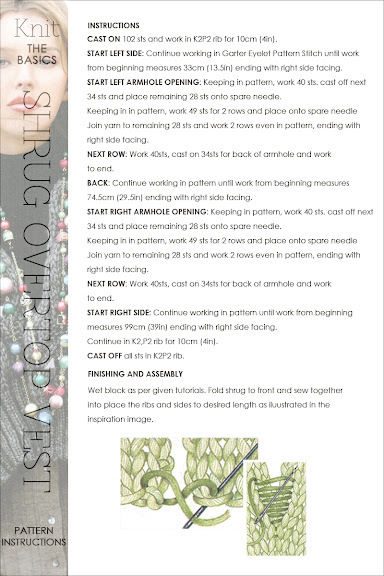 The stitch pattern suggested and featured above is one line of pattern and is included with the pattern instructions. 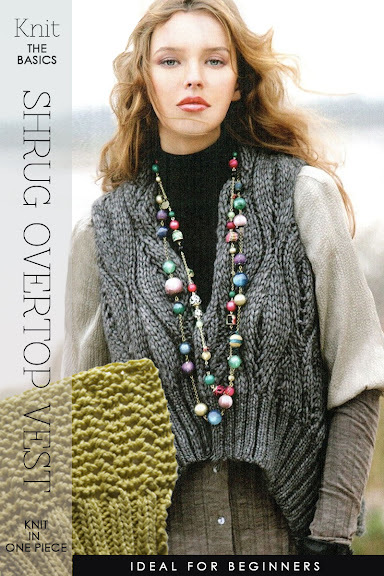 These tops can be casual over a shirt or sweater in a tweedy yarn or evening glamorous in sparkly silk, lurex or angora. Trying different ribs or creating a colourwork design, either nordic or floral for the top side which folds to the front. If sewing the edges does not appeal to you, you can sew buttons and make loops at the front. Let this pattern be your basic for future design inspirations. I know I will. The pattern itself is minimal as it is very simple. You are actually knitting the garment in one piece sideways from one rib edge to the other. Armholes allow the garment to fall forward, the rib edges meeting at the front. 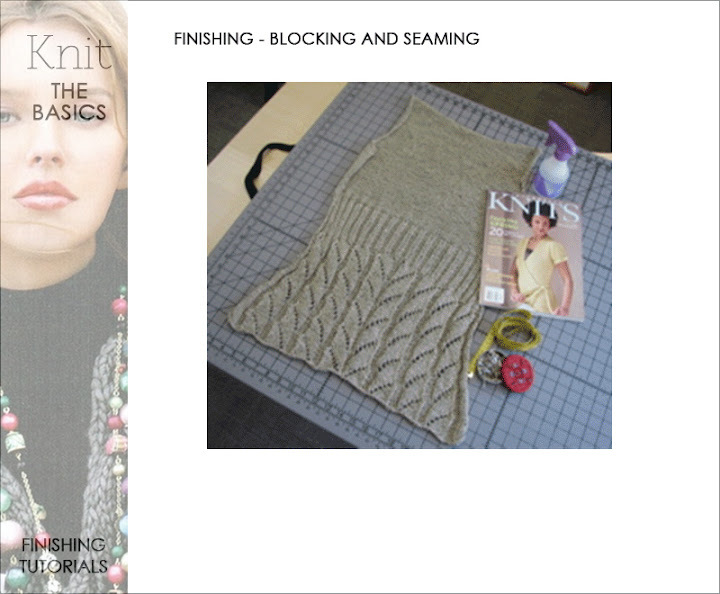 Daria, I am excited to attempt the shrug overtop vest, but have two questions: first, the garter eyelet pattern does not seem to match the pattern in the photo of the project. Second, when worked over 102 stitches, I end up with 2 stitches at the end of the row, rather than 3. The pattern says that it is a multiple of 7, and 102 is not a multiple of 7. Any advice? The multiple is 4 + 2 sts which now makes sense with the 102 cast on. Row1: Row 1: K2, *yo, p2tog, k2; rep from * to end. 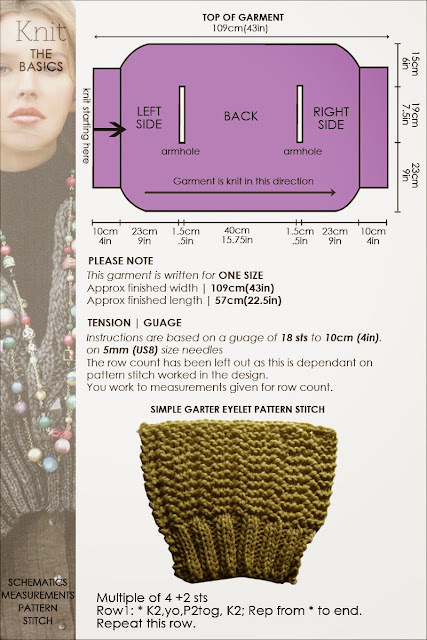 This particular pattern was used for it's shape and measurements. the pattern used in the original was quite complicated. Wow! Sincere thanks for your prompt response! The stitch count makes sense now, and knowing that I am not attempting to replicate the pictured pattern is most helpful, too. One last thing I have noticed: will I be able to stay in pattern when instructed, for instance, to work on 40 sts, and later, to work 2 rows on 49 sts, join remaining 28 sts, etc? The idea is to keep in pattern. This is a very simplistic pattern stitch that shouldn't present a problem.